The plot is wild, with Rick being struck by lightning while on the apartment fire escape, and winding up in a world of “I Love Lucy” sitcoms. Lucy physically emerges from the TV set, and sets about to put Rick’s life in order. During Rick’s delusions, his neighbors Frank and Esther turn up as Mertz-like neighbors, complete with canned TV laughter. 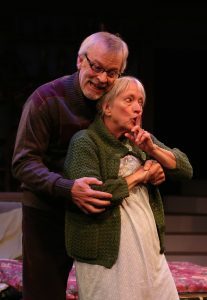 Anne Butler and Logan Ernstthal are both in great form as Frank and Esther. No canned laughter is required in this delightful farce, however. Mehry Eslaminia is basically a riot as the former girlfriend who storms the stage with unyielding energy and enthusiasm. 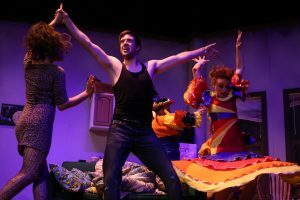 There is an over-the-top scene when everyone takes on Latin American costumes, salsa music, and accents, emerging from the set’s closet. It takes great talent to tackle such a somber subject as Alzheimer’s, and keep the audience completely entertained, as well as educated. Playwright Charlie Thurston, is up to the task. He is only 32 years old, but shows enormous skills as a writer and humanitarian. One of his former teachers was Ron Clark, who now takes center stage in this incredibly interesting look at disease, making promises, keeping promises, and struggling to retain memories that want to vanish! Many in the audience were emotionally affected during much of the show! The show’s star, however, is the incandescent Christy Brandt. She is brilliant as the ageing Helen who is sometimes quite aware of what is going on, sometimes completely lost. One by one she retrieves incidents from her past to share with family and friends, before sending them out of her memory. Many years ago when Helen was younger, her mother was stricken with Alzheimer’s, and she made her close friend, Steve, promise that he would kill her if she ever became as ill as her mother. Kate Berry plays the young Helen, with Graham Ward as the young Steve. Helen and Steve are now older, and Helen is in the same sad situation her mother faced. Steve realizes the promise he made to his friend so many years ago, and struggles with his long-ago decision. Steve is very well played by Stuart Rider, with Ron Brown as Robert, the older man now married to Helen. This is marvelous theatre. Everyone is in excellent form, with some comedy relief provided by Graham Ward as the Young Steve, and a young friend, Peter. Graham is a wonder, sitting deformed in a wheelchair, then rollicking the audience with a “dying scene” which goes on forever, taking over the entire stage.